If you were to ask me what my picture-perfect weekend would look like, it would involve packing up my favorite human, my beloved pup, all my necessary gear, and driving to the mountains. I imagine that there are quite a few people who would agree with this notion. That being said, these outdoor excursions can be cut short, or made incredibly stressful for all involved, when our mountain-climbing dogs have a mountain sized fear of the car. They pace, whine, get sick, or all of the above, and are clearly unhappy and uncomfortable. For dog owners who know this plight all too well, you’ve likely wondered if there’s anything that can be done to remedy this situation. After all, adventure IS out there waiting for us and our four-legged companions…but more often than not, it’s a car trip away. A dog’s discomfort riding in a car can most often be accredited to either motion sickness or anxiety. 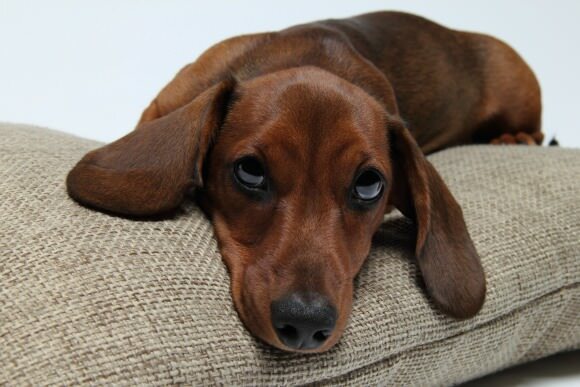 Much like small children, young dogs are more affected by motion sickness due to a structure in their inner ear, called the “vestibular apparatus” , being underdeveloped. The vestibular apparatus is responsible for maintaining balance and a sense of equilibrium, which is why your dog is more likely to feel dizzy, and thus sick, when it’s not fully formed. 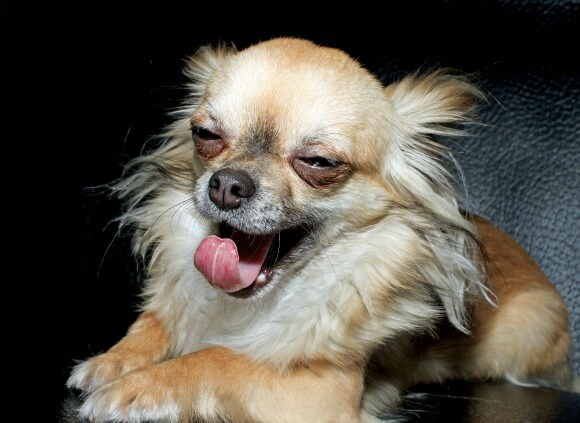 While most dogs will outgrow motion sickness with time as this structure develops, some dogs never fully overcome it. Anxiety is also a common culprit for the uneasy behavior your dog may be displaying. It can be tricky to identify whether your dog is prone to motion sickness or if they’re severely anxious, as the symptoms of both can be pretty similar, and can often stem off of each other due to negative association. While some symptoms of car sickness are obvious, such as vomiting, others can be more subtle. There is no specific test to diagnose motion sickness. A loose diagnosis can be made by your vet, or a veterinarian behaviorist, by ruling out certain neurological and behavioral issues that could otherwise cause similar symptoms. Typically, when a dog is uncomfortable in the car, owners try everything to remedy one condition or the other (car sickness or anxiety). When that doesn’t work, they can be “pretty sure” the cause is the other and start to address that instead. There are many articles out there that address “car sickness” and give you solutions. However, these articles always give solutions for both nausea and anxiety, leaving you to experiment and try to figure out which your dog has on your own. I wanted to help you narrow it down to give you, and your dog, the best chance of overcoming the issue. These tend to be “red flags”. However, signs and symptoms can vary by dog. It IS possible that your dog could show some of these signs even though anxiety is the cause. The two conditions can go hand-in-hand because a dog could get car sick once then develop anxiety or be so anxious that they make themselves sick. Confusing enough? That’s why I asked real dog owners for their advice. How Can Help My Dog? By now you probably have a good idea whether your dog is having trouble because they get carsick or the car makes them really anxious. Start with solutions for that problem and see if you can find something that works. If not, then move onto solutions for the other issue. How to address a dog’s anxiety in the car, or ways help them not get car sick, could be a whole blog post on its own. Someday I might write that blog post but, for now, here are some quick tips and resources. Break the negative association – If the car triggers stress within your dog, the best thing you can do is rewire their association with positive experiences through familiarization. Keep in mind that this may take time, and shouldn’t be rushed. Doing so could easily create more travel anxieties. 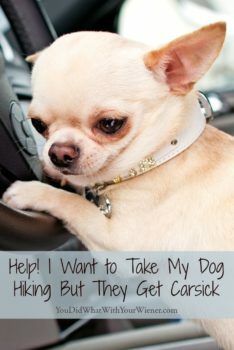 For a “how-to” when desensitizing your dog to the car, check out the articles “Let’s Go for a Ride!” Desensitization for the Fearful Dog and Dog Afraid Of Car Rides? Here’s How to Get Your Dog Comfortable with Riding in the Car. Ease their nerves – Reducing a dog’s anxiety before they get near the car, or calming their nerves once in the car, can make a big difference. Some ways to do that are to “hug them” (apply calming gentle and consistent pressure) with a Thundershirt, use topical aromatherapy oil blends like Earth Heart Travel Calm Aromatherapy Spray or this anxiety relief spray. Playing music like Through a Dog’s Ear: Music to Calm Your Canine Companion can help too (just make sure it doesn’t also put you to sleep!). Give them a calming supplement – Your veterinarian CAN prescribe anti-anxiety medications to your dog. I don’t really suggest it though if you are transporting your dog in the car for “fun” and you plan to hike or be otherwise active at your destination. I fully support using natural calming treats or supplements though. Some good options are CBD Hemp Treats or VetriScience Composure Chews. Distract them – They may be less anxious in the car if you distract them with a stuffed treat toy like the Busy Buddy Waggle or Kong. However, giving your dog something to eat is NOT recommended if their issue is getting car sick so you might want to save this one until you know for sure. Travel on an empty stomach – If a dog has food in their stomach, they can be more likely to feel queasy. On the day you are traveling, you might want to skip your dog’s morning meal or at least feed them a few hours prior to your departure time. Restrain them – Your dog may be more likely to feel sick if they can roam the car, or get jostled around when you take corners, because it can throw their equilibrium. They may do well in a dog car harness that restricts movement like the crash-tested (safety) Clickit Sport by Sleepypod. Let them see out (or don’t) – This one is tricky. Many people have reported that elevating their dog so they could see out the window helped. A dog car seat can help them see out the window and is also a great way to restrain them as mentioned above. Some great booster car seats are the Snoozer Lookout and the crash-tested (safety) PupSaver. Unfortunately, this can have the opposite effect for some dogs though. Some do better when they CAN’T see out. In that case, they may do better sitting lower on the seat or in a crate covered by a blanket. You will have to experiment here to see what works for your dog. Having a dog you want to take on adventures with you, but that has a difficult time with the car, is frustrating. Hopefully, the information in this article helps you. There are numerous resources out there for these issues if you need more assistance. I’ll leave you with some other articles from trusted sources. Montecristo Travels: Taking Your Dog on a Road Trip? My huMom used to have to drive with a big orange tarp in the front seat because I would always get sick. I’ve grown out of vomiting but still don’t like being in a moving vehicle. It’s always exciting to jump inside & go somewhere but once the vehicle starts to move I usually crouch low; rarely do I look out the window. Vans are my preferred mode of transportation. I like to know I can stand up comfortably in the back if I choose to. This is a fabulous article. I have two babes. One who absolutely loves to ride (to and fro) and another who seems to get a bit stressed (to) and fine on the (fro). I think my boy, even after all these years, fears that he may be taken and left somewhere. He’s mentally not all there so I do understand. Generally, a good petting on the head while we’re riding, helps ease him. My girl, she has no problems at all and wants to ride shotgun in my truck. It’s amazing how some don’t mind the ride and others dread it. Thanks for your tips. I’ll be passing it along! Thanks for the shout out! We do road trips AAALLLLL the time. WE are off on a 3 week road trip covering 5 Canadian Provinces in August as part of a mini-moon!! Whoop! That will be so fun! We’ll be in Banff but not until the first part of September. Too bad we can’t meet up.